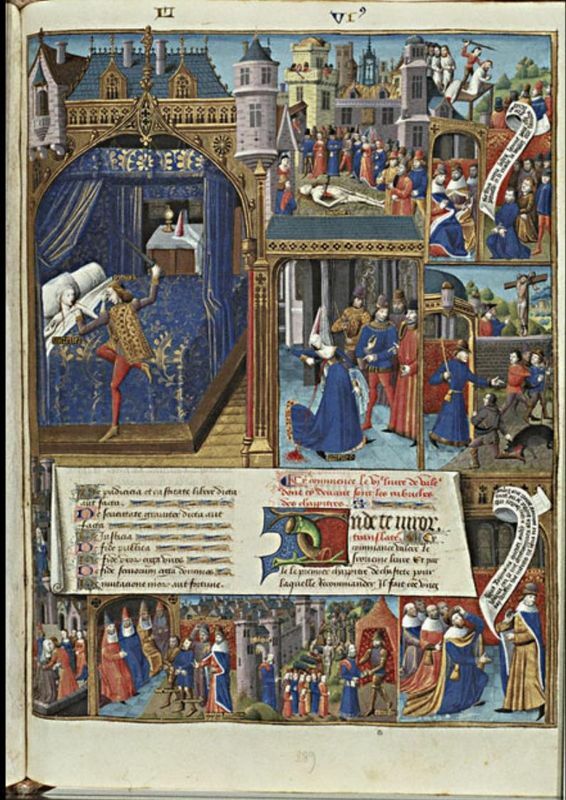 LOS ANGELES, CA.- History played such an integral role in defining national identity in France throughout the high Middle Ages that some of the finest illumination of the period is located within the covers of history manuscripts. On view in the Exhibitions Pavilion at the J. Paul Getty Museum at the Getty Center, November 16, 2010 through February 6, 2011, Imagining the Past in France, 1250-1500 highlights one of the greatest chapters in the history of French art and the development of the French nation, when heroic tales of bygone eras came to life in lavish illuminated manuscripts. These images would allow the French to understand their present and plan for their future by celebrating an epic past. Imagining the Past in France is the first major exhibition devoted to the theme of history in manuscripts, focusing on the use of images to enhance and influence the reader's experience of the text. This monumental exhibition brings together more than 70 objects from the collections of over 25 museums and libraries across Europe and the United States. "As always with an exhibition of this magnitude, we are greatly indebted to the lenders, in the United States and abroad, who are graciously sharing many of their most treasured history manuscripts, several of which have never before been lent outside of their home countries," explained Thomas Kren, acting associate director of collections and senior curator of manuscripts at the J. Paul Getty Museum. "We're particularly delighted that, through this exhibition, one set of manuscripts will be reunited for the first time since they were separated over 500 years ago." Dr. Elizabeth Morrison, curator of manuscripts at the J. Paul Getty Museum and the exhibition's co-curator added, "Imagining the Past will bring together many of the most important history manuscripts in the world by the greatest French illuminators of the Middle Ages, including an extraordinary 13th-century copy of the legend of the Holy Grail-over a foot and a half in height; the Great Chronicles of France made for King Charles V in the 14th-century; and a priceless manuscript of Boccaccio's Concerning the Fates of Illustrious Men and Women, painted by the greatest illuminator of the mid-15th-century, Jean Fouquet." The exhibition will also feature select works of ivory, tapestry, and metalwork that demonstrate how stories from these rare history manuscripts leapt into other artistic forms. In a country governed by elected officials it is difficult to fathom the concept of the divine right of kings whereby the only qualification for power was genealogy. To support their claims to power, rulers and nobleman commissioned monumental-in terms of both scale and quality-historical manuscripts with striking narrative illuminations that helped them imagine themselves as the natural inheritors of the success of ancient conquerors. Concentrating on dramatic and action-filled tales of heroic battles and moral dilemmas, epic figures-Hector of Troy, Alexander the Great, Charlemagne, and even Christian icons like the Virgin Mary-were celebrated in extensive visual narratives that invariably presented them and their adventures in medieval guise. By depicting iconic moments from the past in contemporary costumes and settings, the present was imbued with the historical importance of the past. Moreover, the fact that illuminations were paired with historical texts in French rather than Latin-which had dominated the written word for centuries-made the narratives even more accessible. 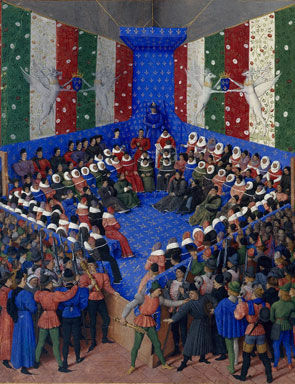 Rulers and members of the nobility often commissioned these manuscripts for personal prestige or political gain, while aligning the nation of France with these historical antecedents encouraged French nationalism. The main concepts of the exhibition are encapsulated in the first gallery through a few extraordinary examples of manuscripts made for powerful members of the aristocracy or royalty, including the famous Bible historiale of Charles V (The Hague, Museum Meermanno) and a copy of Pierre Salmon's Dialogues, with a stunning frontispiece depicting Charles VI (Geneva, Bibliothèque de Genève). 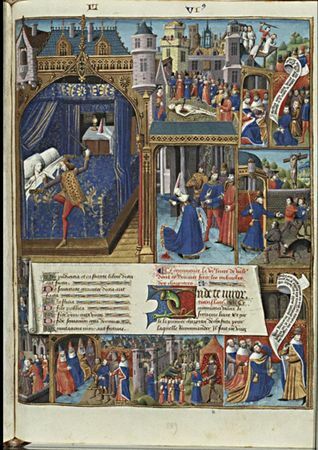 The next three sections consider the different types of history popularized through illuminated manuscripts of the period: Ancient History, Christian History, and Medieval History. Because the modern conception of history differs quite drastically from the medieval, these sections will examine the visual construction of history in diverse texts in French, including bibles, romances, biographies, chronicles, and ancient and medieval histories. Highlights will include a lavish 13th-century book of Arthurian Romances (Morgan Library, New York), a lavish 14th-century copy of the Mirror of History featuring over 700 illuminations (Leiden, Universiteitsbibliotheek, and Paris, Bibliothèque de l'Arsenal), and a spectacular 15 th-century manuscript of Boccaccio's Concerning the Fates of Illustrious Men and Women (Geneva, Bibliothèque de Genève). The exhibition will then move into a section focusing on the Nine Worthies, a series of the nine greatest heroes of history divided among three historical eras, first popularized in the early 14th-century. The tri-partite division into Ancient, Biblical, and Medieval heroes reflects the divisions of the exhibition. The section includes one of the earliest copies of Jacques de Longuyon's Voeux du paon (Vows of the Peacock), the text in which the concept of the Nine Worthies was originally introduced (New York, Morgan Library). The exhibition culminates in a last section devoted to how these historical narratives penetrated medieval culture to such a great extent that they began to migrate to other countries and into other media. Stories originating in French manuscripts appeared as far away as England, Italy, and Spain, and were carved in ivory, woven into tapestries, and even sewn in pearls on money-purses. Examples will include a chronicle concerning the Trojan War from El Escorial's Biblioteca del Monasterio de San Lorenzo, the Louvre's great tapestry telling of the miracles of Saint Quentin, the Metropolitan Museum's celebrated aquamanile depicting Aristotle and Phyllis, and the Cluny Museum's delicate ivory mirror back with a scene from the legend of Tristan and Isolde. The manuscripts and other objects featured in Imagining the Past in France represent an unprecedented gathering of some of the finest historical works produced in medieval France. Immensely successful at the French court and created by the most prominent artists of the day, these pieces served as both sources of adventurous excitement and disseminators of propaganda. 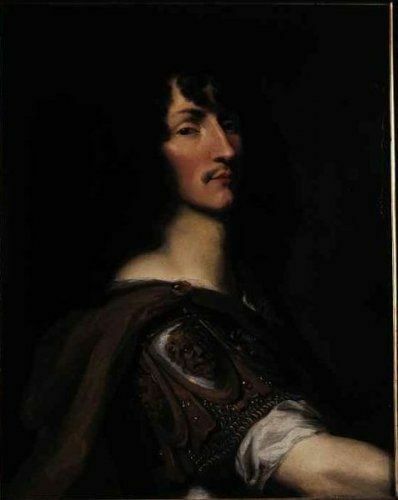 In appealing to the authority of the past, they inherently reflected the values and belief systems of the French nation in a way that supported and validated its very existence. Despite the rarity and light sensitivity of these priceless objects, colleagues at institutions in America and abroad have generously shared their masterpieces, many of which are national treasures. 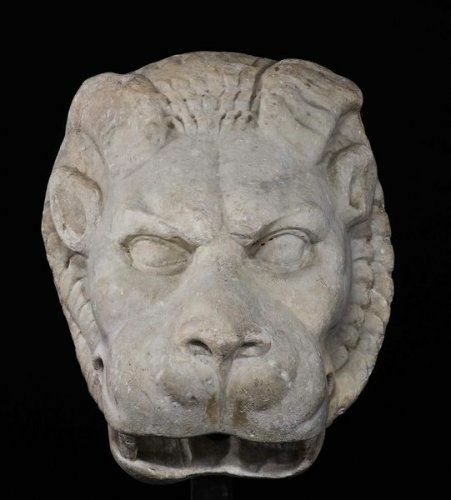 The Getty Museum is profoundly grateful for the more than 70 objects being generously lent by 25 institutions, including the Bayerische Staatsbibliothek, Munich; Bibliothèque de Genève, Geneva; the Beinecke Rare Book and Manuscript Library at Yale University, New Haven; Bibliothèque Nationale de France , the Bibliothèque d l'Arsenal, and the Musée du Louvre, Paris; the British Library, London; Koninklijke Bibliotheek and the Museum Meermanno-Westreenianum, the Hague; the Kupferstichkabinett, Berlin; the Metropolitan Museum of Art and the Morgan Library and Museum, New York; National Library of Russia, Saint Petersburg; and Universiteitsbibliotheek, Leiden. In addition, masterworks are being lent by distinguished private collections. The exhibition will also include six exceptional manuscripts and leaves from the Getty's own collection. Imagining the Past in France, 1250-1500 is organized by the J. Paul Getty Museum and curated by Dr. Elizabeth Morrison, curator of manuscripts at the J. Paul Getty Museum, in conjunction with Dr. Anne D. Hedeman, Professor of Art History at the University of Illinois at Urbana-Champaign. The exhibition will also be accompanied by a 376-page catalogue ($80 hardcover, $49.95 paperback) with 192 sumptuous color illustrations and detailed entries for each object in the exhibition. In addition, the catalogue will include a series of essays on subjects ranging from the role of the vernacular in history manuscripts and the blurring of genres such as romance and history, to the origins of secular illumination and the contributions to the development of history illustration by individual artists. Catalogue contributors include Elizabeth Morrison, Curator of Manuscripts at the Getty Museum; Anne D. Hedeman, Professor of Art History at the University of Illinois, Champaign-Urbana; Gabrielle Spiegel, Professor of History at Johns Hopkins University; Keith Busby, Professor of French at the University of Wisconsin-Madison; Joyce Coleman, Professor of English at the University of Oklahoma; Élisabeth Antoine, Curator in the Département des Objets d'art at the Louvre; R. Howard Bloch, the Sterling Professor of French at Yale University; and Erin Donovan, Research Assistant in the Department of Manuscripts at the Getty Museum. This landmark exhibition will take place only at the Getty and will be the subject of a symposium open to the public (reservations required) on Feb. 3-5, 2011. Consult the Getty website for lectures and other related programs.